I Love You Teddy Bear - 24"
Plush Brown Teddy Bear - 24"
LOVE the Gund bears and your personalization. Wish you had the BIG Gund bears again!! This classic “I Heart” design is a popular and romantic way to express your deepest, heartfelt emotions. It creates the perfect way to celebrate any romantic occasion. This passionate design is featured on this 24” plush brown bear made by Gund. This bear has an adorable look along with a soft, cuddly feel. It wears a red bow and has tan fur on its snout, ears and feet. Personalize this design with any name to make for a memorable Valentine's Day gift! A free gift wrapping and a free gift message is included with every purchase to give this gift some style. Turn this adorable brown bear into a special treat for the one you love. 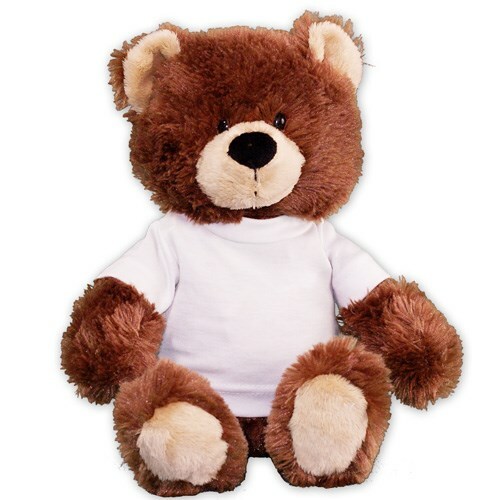 This Brown Teddy Bear has an irresistible look on its face along with a wonderfully soft feel. Featuring a festive red bow & contrasting tan fur on it's snout, ears and feet. Measuring about 24” tall and makes a wonderful gift for any occasion. Free Gift Wrapping and a Free Gift Card are included to create a thoughtful presentation. I was very pleased with what I got. It's going to put a big smile on my girlfriend once I give it to her. Additional Details Shop our entire collection of love gifts to find a unique way to surprise that special someone. We also have great plush Valentine's Day gift ideas that will definitely buy you some brownie points!